"When it's done right, noir is a darkly delicious thrill: smart, sharp-tongued, surprising. The knife goes in at the end with a twist. 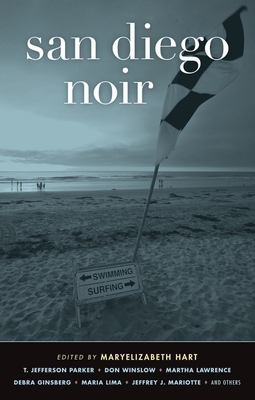 San Diego Noir, a new 15-story collection by some of the region's best writers, has all that going for it, and the steady supply of hometown references makes it even more fun." Brand-new stories by: T. Jefferson Parker, Jeffrey J. Mariotte, Martha Lawrence, Diane Clark & Astrid Bear, Debra Ginsberg, Morgan Hunt, Ken Kuhlken, Taffy Cannon, Don Winslow, Cameron Pierce Hughes, Lisa Brackmann, Gabriel R. Barillas, Gar Anthony Haywood, and Maria Lima. Launched with the summer '04 award-winning best seller Brooklyn Noir, Akashic Books continues its groundbreaking series of original noir anthologies. Each book is comprised of all-new stories, each one set in a distinct neighborhood or location within the city of the book. In the 50-plus years since Raymond Chandler set Playback in Esmeralda, his name for La Jolla, the population has grown by more than a million, and crime has proliferated as well. San Diego of the past and the present offers the book's contributors a rich selection of settings, from the cross on Mount Soledad to the piers of Ocean Beach, and perpetrators and victims from the residents of its wealthiest enclaves to the inhabitants of its segregated barrios. Maryelizabeth Hart is a co-owner of Mysterious Galaxy, an independent mystery and science fiction bookstore in San Diego, founded in 1993. In addition to her bookseller responsibilities, she is a reviewer for Publishers Weekly and an occasional contributor to works of nonfiction, including Women in Science Fiction and Fantasy (Greenwood Press).